Oh my goodness, I have found the best fall inspired snack. 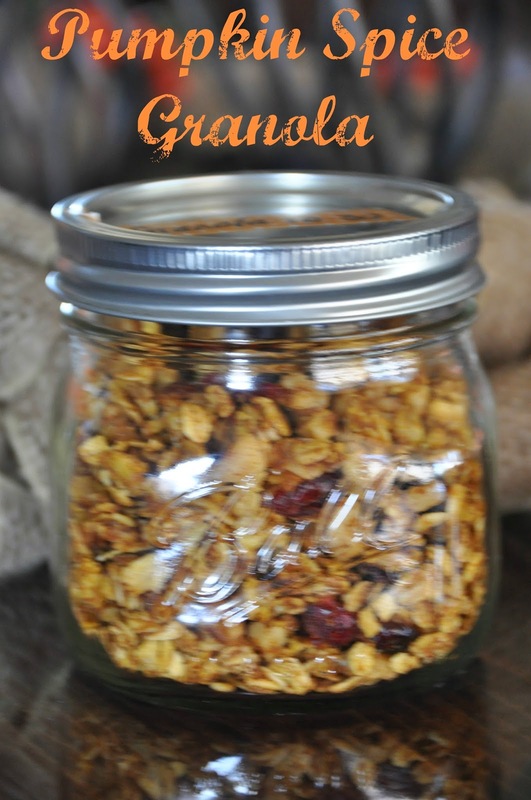 It is called Pumpkin Spice Granola and it is oh so yummy. Please visit Joyful Healthy Eats for the original recipe. The recipe is super simple and I had everything on hand (which rarely happens). I only made two minor adjustments. I used walnuts instead of almonds and added extra dried cranberries. I also think pistachios would be tasty. My six year old son is currently learning different suffixes and the rules for applying a suffix to a root word. These are the rules we are currently working on. 1. If the root word has a short vowel sound and ends with a consonant, double the consonant and add the suffix. 2. If the root word has a long vowel sound followed by a consonant and ending with a silent vowel, drop the silent vowel and add the suffix. Since Halloween is this Friday, I thought it would be fun to have a suffix review with a little bit of a Halloween theme. This isn't anything overly creative but I think he will really enjoy it. Each card works with a certain suffix. Looking at the card, the left side contains words that have to do with rule #1. The right side of the cards uses words that pertain to rule #2. The bats are really just for fun and matching to each card. He will have to re-write each word with the correct suffix. The stickers are for marking each correct word after he is finished. My kids love marking their work with stickers, stamps, markers, etc. Like I said, it isn't anything overly creative but sometimes getting out of the book, using colorful cards, and fun stickers makes the morning more enjoyable. The box seemed to be singing my name and jumped into my arms when I opened the doors. Okay, maybe not but I had been counting down the days to receive this little gem. Eeee, "Your stylist..." Yes that is right, I don't shop for myself, my stylist does that for me". Hehehe, I was having way too much fun! Everything was wrapped up in the cutest little bundle. This envelope (remember from my stylist) contained an invoice and price breakdown of all items, plus the cutest little wardrobe cards. I love the wardrobe cards! It was so much fun to look at the different ideas for incorporating the five pieces that were in the box. Okay, so let's get to the best part - the GOODS!!!! This was by far my most favorite piece. I love, love, love tunics with leggings and riding boots. This fit perfectly into my current wardrobe yet included colors I really never pick for myself. I like the diversity of wearing it belted or unbelted. Also, you could add a skinny leather belt or even a chunkier belt for another look. I wore this top to Bible study last night and received several compliments. Now, this teal (color is showing different in the picture) and navy top was super cute. Unfortunately, the fit was not good. I always like cardigans, especially with 3/4 length sleeves. However, I wasn't crazy about the color. I couldn't decide if it was maroon or more brown - strange. Also, I think I could get a similar cardigan at Target for a lot less money. Overall, I am only keeping one item but I loved every bit of the process. This morning I left notes and opinions on each item for my stylist (as instructed). I packaged all returning items in the provided bag and dropped it off at a local UPS stop. So, Simple!!! My next delivery will arrive December 2nd. I am counting down the days!! !